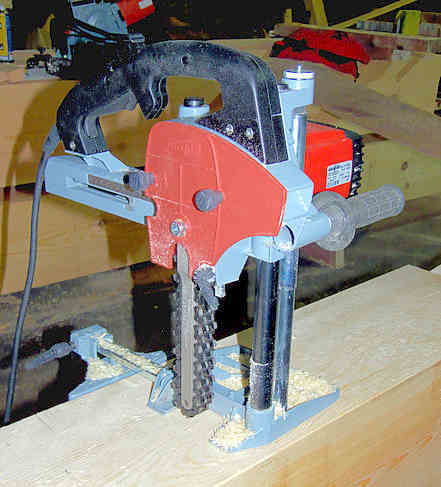 In woodworking: A machine that uses an endless chain to cut mortises in timber. I can remember the very first time that I saw one of these portable chain machines. In 1966 I was hitch-hiking around Japan and I wandered onto a building site in Kyoto. The guys were building a traditional Japanese timber frame house, with the frame being about 6" thick. All the joints, studs to plates were mortise and tenon and while the guys did a lot of hand work, they had one of these portable machines that was built by Making. In the time span between then and now, I have no doubt that Making have improved their mortise no end and also that there are now a large amount of other companies that make them. At that time I had never seen a portable machine like this in either the UK or Australia. I had seen and used very heavy solid cast iron framed workshop machines, but what amazed me was the fact that the portable mortise was performing as good as a workshop machine in respect of the cutting, but it has the advantage or being portable. It takes up less space in a small workshop and it can be packed away when not needed. 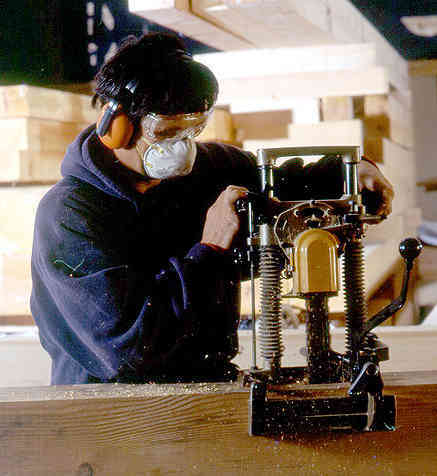 Like a portable magnetic electric drill, it has the tremendous advantage of allowing one person to work on large and heavy timbers without needing extra help to move the timber to the machine. While chain mortises are a lot faster than hollow chisel mortises they are slightly rougher. The downward side of the chain leaves a clean cut, but the other side, the upward cut leaves whiskers or sometimes splinters. The trick to stop this is to do a shallow cut first so the the upward end is angled say 45deg. then cut to it but not quite. So that maybe 1/16" of the bevel is left showing.